I’ve probably eaten a hundred of these salmon cakes in the past 6 months. My only explanation is that I really like them, plus I was making up for lost time, since salmon cakes were not a food I really knew until last September. Crab cakes? Sure, I ate those on occasion. 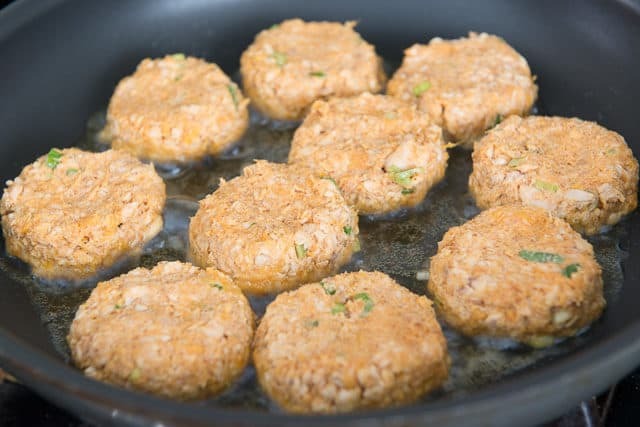 And I’ve been making fish burgers (like these flounder burgers) since I first started this site in 2010, and those are basically like gigantic fish cakes. But salmon cakes were new to me until my first Whole30 last fall. 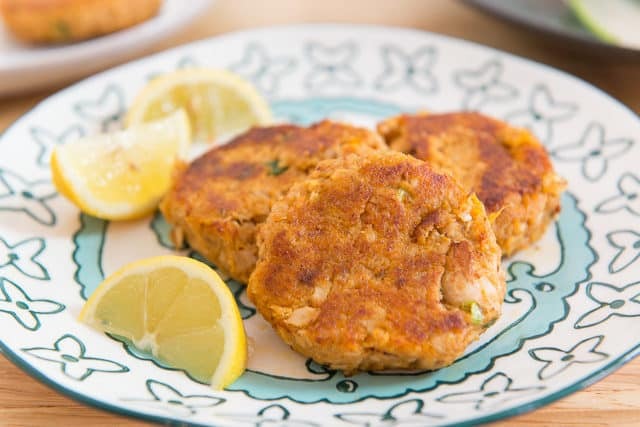 Before I started the program, I picked up a couple Whole30 recipe books and noticed that salmon cakes were one of the most popular suggested recipes. I tried a few of the recommended renditions, and ended up making my own version that’s a mishmash of ingredients and methods from the ones I tried. This version has three main components, which are salmon, sweet potato, and chipotle, and they’re all magical together. I like that the mashed sweet potato keeps them softer than an only-protein cake, and the chipotle is smoky and delicious. 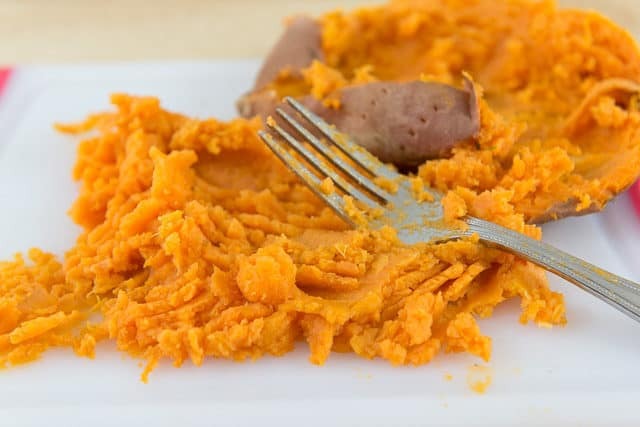 To get started, you need some mashed sweet potato. Canned salmon was something I had never purchased until my Whole30, when their salmon cake recipe called for it. 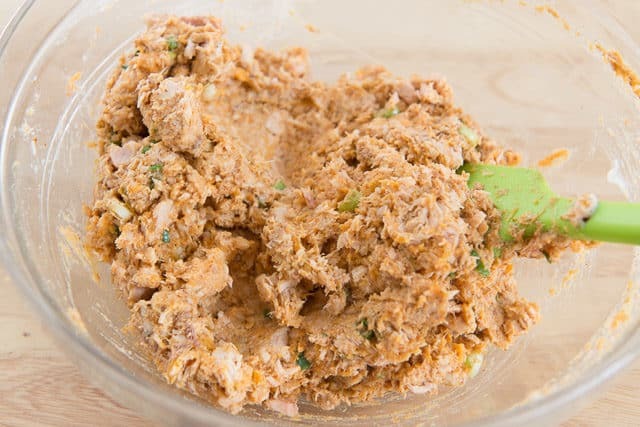 It doesn’t taste the same as fresh (it tastes more similar to canned tuna), but I like that it’s always in the pantry and available to be cooked, and that’s kind of the idea here. You can definitely use fresh if you prefer! This Baked Salmon is an easy way to prepare salmon for this recipe, then you can flake it up for mixing. MAKE SURE you buy boneless skinless salmon. Oh my word. Picking out the bones in canned salmon is so much worse than I could’ve ever imagined. Flip when they’re golden brown on the first side, which should take 3-4 minutes. Then you can serve the salmon cakes with a couple lemon wedges, or tartar sauce. I find that the salmon cakes have enough flavor on their own that a sauce is not required though. 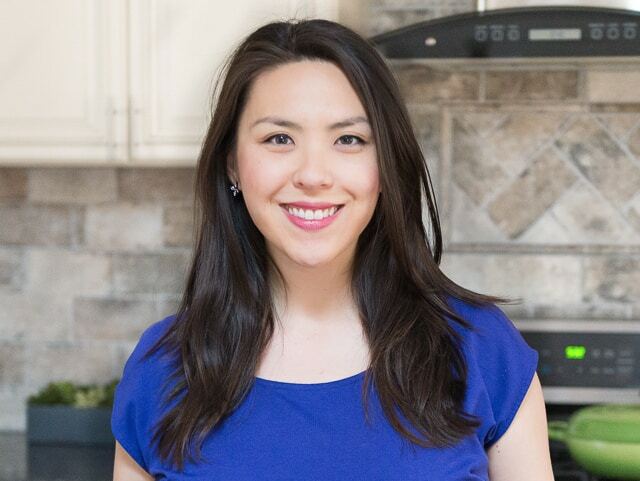 You can find more of my healthy Whole30 recipes and some of my favorites are Coconut Green Curry Mussels, Citrus Garlic Herb Chicken Thighs, and Jalapeno Cilantro Sauce. Get the full recipe below, plus a video of the whole process below that, if you’d like more guidance. Enjoy! How long will salmon cakes keep? 2-3 days in the fridge. 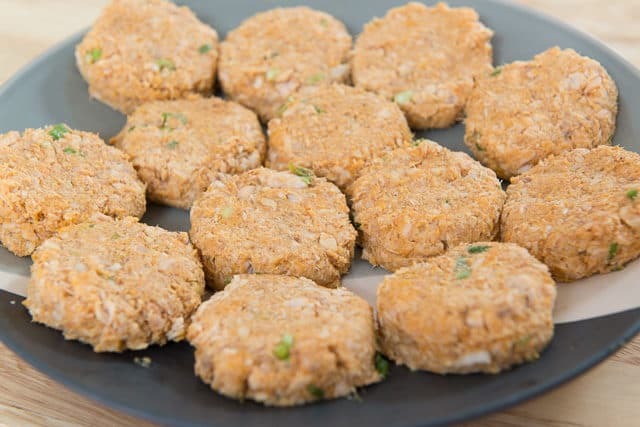 Can salmon cakes be frozen? Yes, let them cool completely and then store in an airtight container for up to 2 months. 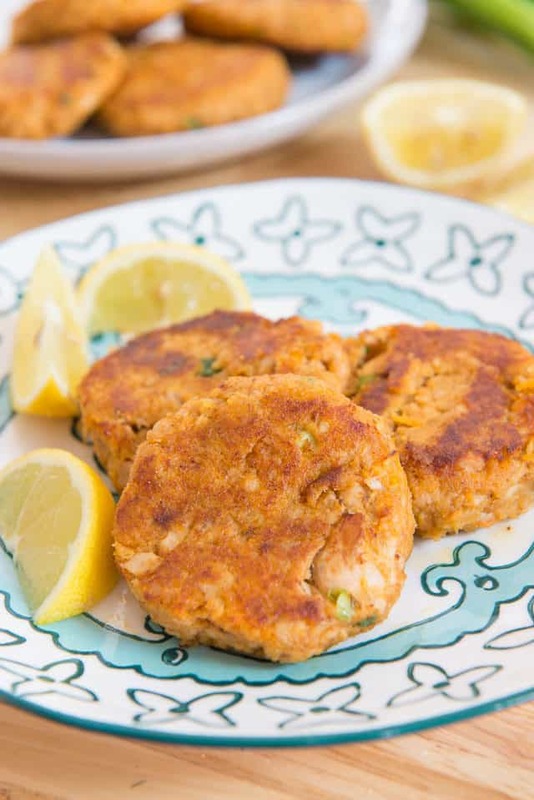 Can salmon cakes be baked? Yes, you can bake these instead, at about 400F for 10 minutes. I prefer pan-frying because then they get a bit crispy, and you can use a healthy oil of choice like olive oil or avocado oil. Can salmon patties be made ahead of time? Yes, shape them and store in the fridge in an airtight container for up to 8 hours. What goes with salmon cakes? I think these are nice when served with a big salad or garlic herb steak fries. 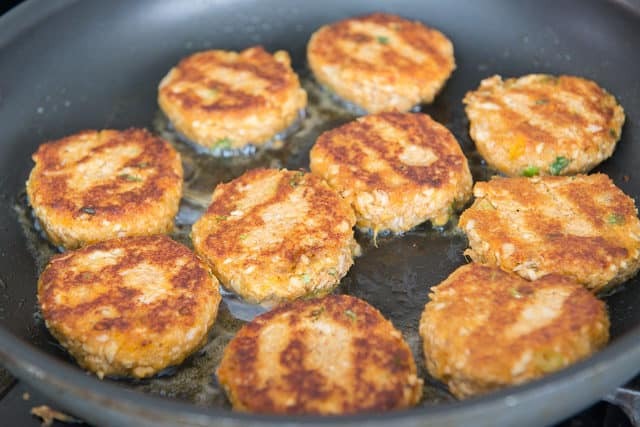 How to fry salmon cakes: Get a decently high smoke point oil like a light olive oil or avocado oil, then cook the patties for about 2-3 minutes on each side until golden brown and crispy. 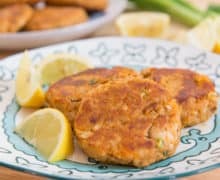 Are these salmon cakes healthy? Yes, these are Whole30-compliant, paleo, gluten-free, and dairy-free! 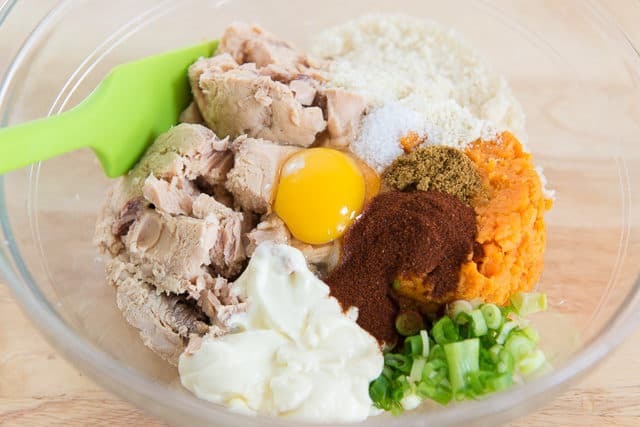 In a large bowl, stir to combine all the ingredients. Using a large 3-Tbsp cookie scoop, portion the cake mixture into your hands and flatten it out into a patty about 1/2" thick. Heat a large nonstick skillet over medium heat, then add enough olive oil to coat the bottom of the pan, about 3 tablespoons. Pan fry the salmon cakes in the oil for about 3 minutes on each side until golden, in batches if needed. Very good. I baked mine. Used canned salmon with bones. Just mashed the bones down, no need to remove them. Hi Mary, glad the baking went well. Good to know about mashing the bones down. We feed these to our baby so we were concerned about the bones, but I could see that maybe they’d break down a bit. I made this today but with chicken instead of salmon. Delicious! Thanks for the great recipe. Hi Caroline, that’s great! Thanks for letting us know here in the comments that the substitution went well! Can I substitute all purpose flour for the blanched almond flour or will it change the flavor and/or consistency? Hi Sara, I haven’t tested it personally, so not sure how it’d go. I think maybe something like bread crumbs would work better, since regular flour is finer than the ground up almond.